Journey with unlimited rides between select areas of Kansai and Chubu using this convenient train pass. Make the most out of your trip as you hop from city to city with ease. Infants traveling alone will require a child rail pass. Shipping fee add-on must be selected in order to facilitate voucher delivery to your address. Select this option if you reside in the Philippines. 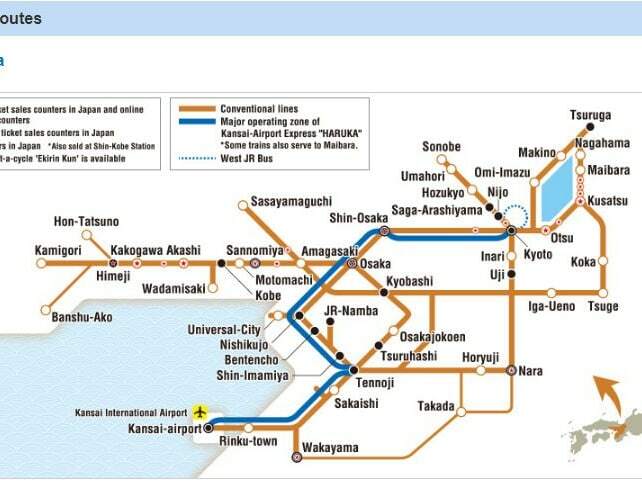 3-Day Kansai Area pass is valid for unlimited travel within the valid areas on the detailed map. Please see photo for reference. Please note that the Miscellaneous Charges Order (MCO) will be mailed to your preferred address. Please provide the necessary information during the booking process and select the appropriate shipping fee from the "add-on" section. After entering Japan, present the MCO along with your passport at the indicated exchange locations below. Fill out an application with the necessary details and claim your 3-Day Kansai Area pass. *Please note that the train passes are not valid for use on bullet trains or "Shinkansen". Once delivered, the Miscellaneous Charges Order (MCO) must be exchanged within 3 months. Once the pass has been obtained, the activation date and duration can no longer be changed. The validity of a rail pass starts from 12 midnight from the day the MCO is exchanged. The Kansai Area Pass is only for foreign tourists holding a passport issued by a foreign government and entering as a "Temporary Visitor". Japanese passport holders can NOT use this pass. Please refer to the link below for the detailed area route map. You will need your passport to exchange the voucher (Miscellaneous Charges Order). Please bring your passport with you on the travel date, so it may be presented when a JR staff asks for it. A rail pass is valid for 3 consecutive days. Conditions of use for a rail pass are stipulated by JR-WEST's carriage conditions and laws of Japan. A rail pass will be void if the magnetic ticket is detached from a rail pass book and will not be reissued even if lost or stolen. No refund will be given after a rail pass has already been used or expired and in the event of non-availability of service, delays or similar issues. One adult or child rail pass holder can accompany up to two (2) infants, ages 5 years old and below, for free provided they sit on an adult's lap. However, a third infant will require a child rail pass to join.